There are times when all you really need in life is a big ol’ plate of greasy food. Last week, while waiting for my connecting flight in the Philadelphia airport, I dug into a heaping plate of eggs, bacon, home fries and rye toast. When you’re up at 4:30 in the morning, a big greasy breakfast really hits the spot. A big breakfast is more than just a meal. It’s a cultural experience and has always been a big part of my life (I know that sounds funny so let me explain). As a kid, I had a Sunday Sun paper route. After delivering all my papers, I’d crawl back into bed and would wake up to the smell of bacon frying through the house—a wonderful memory of my Mom. After my Mom passed away, my Dad, my brothers and I would go every Sunday to the Orchard Family Restaurant at Dundas and Highway 10 in Mississauga—still one of the best breakfasts around. In university days, Sunday greasy breakfasts became the culmination of a weekend of partying at my friends’ townhouse in Waterloo. Life is more sedate these days, and now my favourite big greasy breakfast (other than when I’m on the road) is camping trips with Dave and the girls. 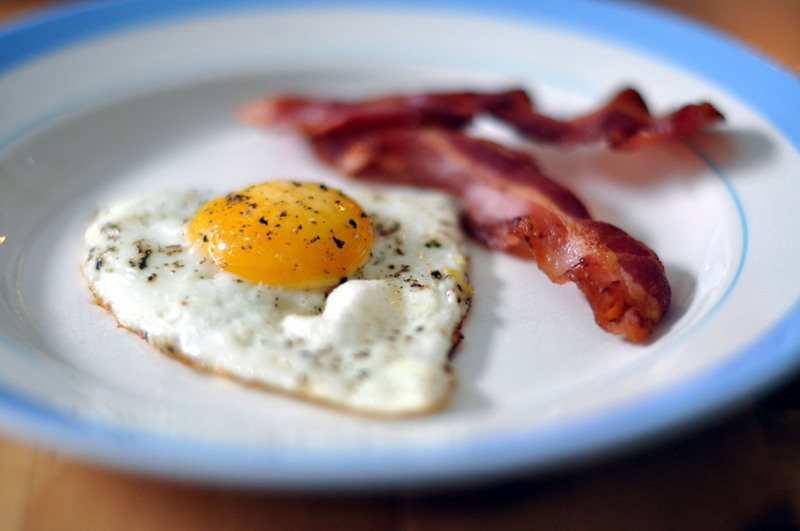 This week’s #HappyAct is to chow down on a big greasy breakfast. Don’t count the calories; count the memories. What’s your favourite greasy spoon? Start a list by leaving a comment. If anyone knows of a good one in the Kingston area, let me know. The Georgeview on Hwy 7 in Georgetown. Classic egg & bacon breakfast plus classic decor from decades past. Thanks, Jilly, there used to be a great place in Norval too–is it still there? Love Morrisons, of course. It was the first place we hit during the ice storm! We’ve been visiting Carmelinda’s (corner of Bayridge & Princess) a lot lately – you need something hearty after that early morning hockey practice.